2014 can be characterised as a year of solid growth for the North West. It was also a year when rebalancing the UK regions rose up the political and local agenda, with the North very much the focus of the devolution debate. Liverpool has fantastic universities who already play a key role in knowledge and innovation; the NW has the highest number of apprenticeships in the country and skills are high on the agenda. With the emergence of the Combined Authority, there is a real appetite for devolved and decentralised powers. 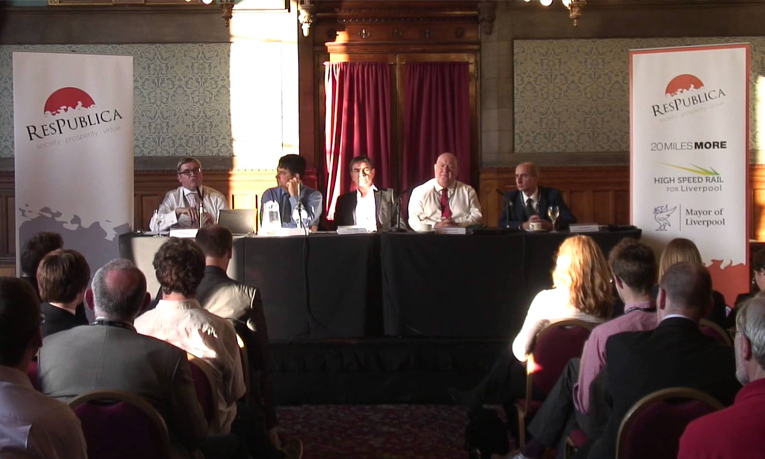 In the following video I talk about how cities and regions need to build their own economic strengths and capabilities – not rivalling London and the South East, but replicating the characteristics that have made them successful. Click here to hear more. As I talk about in the video, investment in transport infrastructure will play a fundamental role in creating a Northern Powerhouse. The fact it currently takes three and a quarter hours by train to travel about 130 miles between the two ports of Liverpool and Hull, is clearly not good enough and is counterproductive in getting the region to think collectively. While HS3 is a step in the right direction to improving transport links across the North, it is deeply disappointing that Liverpool remains out of the frame for both HS2 and HS3 rail links. My fear is that without fit-for-purpose transport we will begin to see the emergence of a North-North divide, as secondary locations with poor connectivity struggle to attract business and jobs. The ingredients are there for economic regeneration but, if investment in transport infrastructure does not extend to Liverpool, the City risks being left in the margins. Liverpool is missing out on a huge investment opportunity if it fails to secure plans for its own high speed rail link up, it has been claimed. The warning follows news that government tenants are in talks to take up to 430,000 sq ft of offices at the Mayfield regeneration site near Piccadilly Station in Manchester, close to the proposed high speed (HS2) station, scheduled to complete in 2026. 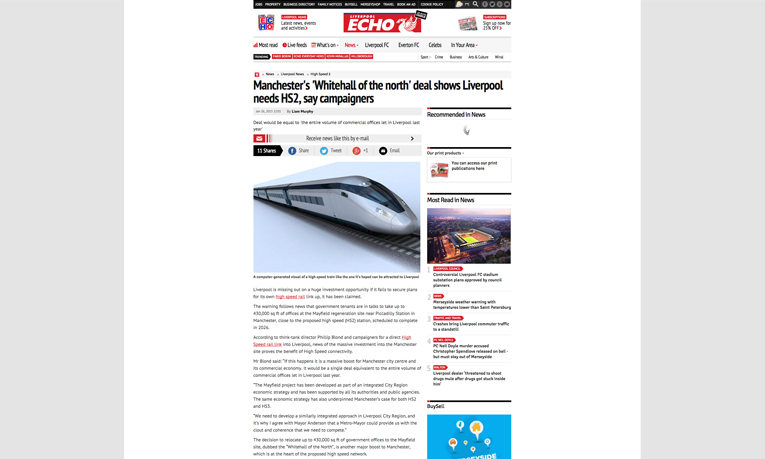 According to think-tank director Phillip Blond and campaigners for a direct High Speed rail link into Liverpool, news of the massive investment into the Manchester site proves the benefit of High Speed connectivity. 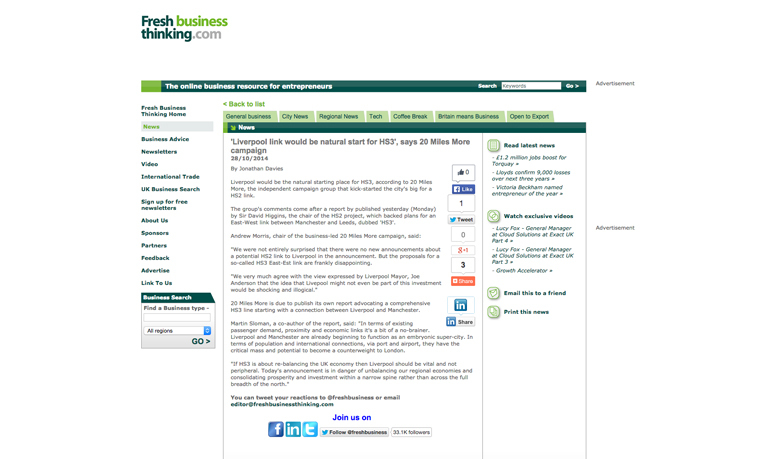 Mr Blond said: “If this happens it is a massive boost for Manchester city centre and its commercial economy. It would be a single deal equivalent to the entire volume of commercial offices let in Liverpool last year. “The Mayfield project has been developed as part of an integrated City Region economic strategy and has been supported by all its authorities and public agencies. The same economic strategy has also underpinned Manchester’s case for both HS2 and HS3. The decision to relocate up to 430,000 sq ft of government offices to the Mayfield site, dubbed the “Whitehall of the North”, is another major boost to Manchester, which is at the heart of the proposed high speed network. Regionally the Mayfield site has been seen as direct competition for the Pall Mall/Exchange Station area adjacent to Liverpool’s commercial district which has also been earmarked as an opportunity for civil service relocation. The public policy think tank, ResPublica and business-led campaign group 20 Miles More believe the Manchester announcement underscores the competitive disadvantage that Liverpool will face unless it secures a direct link to HS2. Independent pressure group 20 Miles More who launched Liverpool’s original public campaign for an HS2 link called the decision depressing and predictable, and its chair Andrew Morris said: “There is a similar opportunity in Liverpool at Pall Mall on the edge of our Commercial District which would probably be a more cost effective solution to Government Departments struggling under the burden of austerity. Liverpool would be the natural starting place for HS3, according to 20 Miles More, the independent campaign group that kick-started the city’s big for a HS2 link. The group’s comments come after a report by published yesterday (Monday) by Sir David Higgins, the chair of the HS2 project, which backed plans for an East-West link between Manchester and Leeds, dubbed ‘HS3’. “We were not entirely surprised that there were no new announcements about a potential HS2 link to Liverpool in the announcement. But the proposals for a so-called HS3 East-Est link are frankly disappointing. 20 Miles More is due to publish its own report advocating a comprehensive HS3 line starting with a connection between Liverpool and Manchester. Martin Sloman, a co-author of the report, said: “In terms of existing passenger demand, proximity and economic links it’s a bit of a no-brainer. Liverpool and Manchester are already beginning to function as an embryonic super-city. In terms of population and international connections, via port and airport, they have the critical mass and potential to become a counterweight to London. 20 Miles more, who kick-started Liverpool’s bid for a High Speed rail link, has expressed its concern about the implications of the announcement by Government and HS2 Chair, Sir David Higgins, which sees the city still omitted from the proposed HS2 route in the Rebalancing Britain report. 20 Miles More believes that connecting Liverpool and Manchester under HS2 would then create the obvious starting point for any HS3 proposals to join up the major Northern cities on an East-West line. 20 Miles More have pledged to redouble their own campaigning efforts and build the widest possible coalition behind the call for a direct High Speed link to Liverpool. “We started this campaign with a very simple call for 20 miles of additional track to take HS2 to the UK’s western gateway and one of its fastest growing city economies. That call is now stronger than ever. That link needs to be considered as a next stage of HS2, and not simply an element of HS3 which, at the moment is nothing more than an uncosted aspiration. The event was hosted by ResPublica. Transport Times Chief Executive Professor David Begg was in the chair. Opening the meeting, the Chair declared that the result of the Scottish independence referendum and the resulting further pledges on devolution was good for transport policy. He pointed to the successes of Scotland and London as good examples of transport devolution. The north of England needed to mobilise and grasp the opportunities posed by constitutional change, the Chair said. On the subject of constitutional change, he urged the attendees not to pursue the idea of an English assembly, which he believed would end up being dominated by London and the South East. Instead, the Chair called for power to be devolved to the city regions. Commencing his remarks, Lord Adonis credited Transport Times with helping to win him over on the case for high speed rail whilst he was in government. Any English devolution must come with an elected component and this would be integral for any transfer of transport powers, the Shadow Minister said. Turning to HS2 and HS3, Lord Adonis emphasised that the existing rail network could only be refitted at massive cost. “This is what you will have to go through unless you invest in new capacity between major conurbations”, he told the meeting. Lord Adonis called for the major cities of the Midlands and the North to be brought together by HS2. It would be a transformation if it were possible to travel between key cities in 30 minutes or so, he said. The original railway had never been built to be connected, being originally designed as a series of freestanding lines to London, the Shadow Minister explained. HS3 would be “the Crossrail of the North”, Lord Adonis declared. He noted that the programme of electrification had begun under the last Labour Government and had continued under the Coalition. “We need transformed connectivity both between northern cities and London and between the key cities”, Lord Adonis remarked. Noting the importance of building cross-party consensus on big infrastructure projects, he urged Labour to support the Government’s proposals on HS3 if the party believed it would deliver for the North. By supporting the plans, it would be easy to build support for legislating for the new line, Lord Adonis concluded. Hailing Labour leader Ed Miliband’s policy of a constitutional convention on the future of the UK, Mr Twigg praised the work of elected city mayors like Joe Anderson. He supported the case for extending high speed rail to Liverpool, emphasising that it would bring a greater economic impact to the city. The Shadow Minister approved of the idea of creating a mayoralty for a metropolitan area like Merseyside. It would be important for Liverpool to share in the enormous benefits that HS2 would eventually bring to the whole country, Mr Twigg declared. If an elected mayor was good enough for London, then it was good enough for Merseyside, Mr Anderson declared. He explained that the Core Cities Group had nearly been outflanked on HS2, crediting the success in pushing the project forward due to lobbying by city leaders. It was important to invest in modernising infrastructure to keep the UK ahead of its competitors, Mr Anderson said. HS2 only needed to be extended by 20 miles more to connect into Liverpool, he told the fringe. 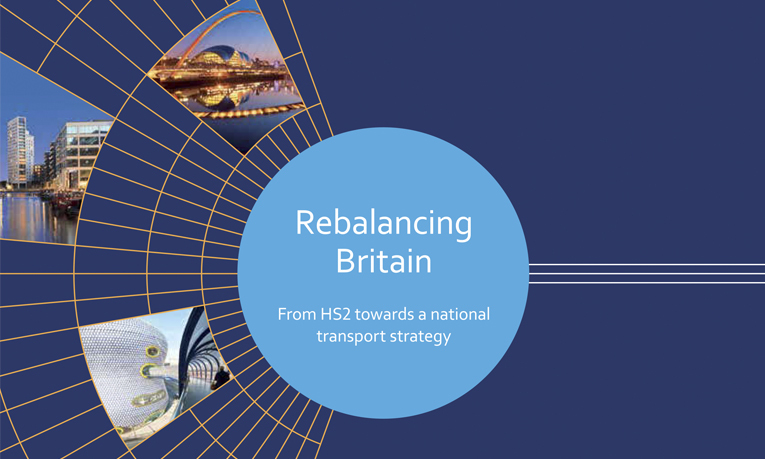 Mr Anderson said that HS2 could not be delivered without improving east-west connectivity via HS3. Noting Liverpool’s investment in a super port, the Mayor emphasised that the freight industry viewed rail as viable option for moving goods, particularly as rising diesel prices impacted on travel by road. He recalled that the case for investment in Liverpool was being made to the highest levels of the Government and the Opposition. “We need to articulate the case for HS3 to connect the North and ensure that we are not left behind in terms of investment, Mr Anderson said. “It is not just about the regeneration of the North West. It is about the regeneration of the UK”, he concluded. “What we desperately need is strategic thinking in the Conservative Party”, Mr Blond said. He said that a “strong Tory presence” in the north was necessary for the good of the country. Praising the “northern powerhouse” concept put forward by Chancellor George Osborne, Mr Blond warned that many areas of the country felt abandoned and forgotten. Left and right had responded to globalisation in the same way and left certain parts of the country to “wither on the vine”, he said. Mr Blond claimed that the UK was already a divided nation and that fewer people were getting ahead in life. Labour was ahead of the Conservatives in arguing that there were some failures in modern capitalism, he remarked. HS2 and HS3 were part of the “crucial answer for rebalancing the UK economy”, Mr Blond declared, but cautioned that it would not solve the problem of low wages and falling living standards. He believed that the case for HS2 was strengthened by HS3 because the latter would help connect the core northern cities. If Liverpool did not get high speed rail then it was doomed to become a small, seaside town that was never visited, the ResPublica Director told the meeting. Mr Blond forecast that the development of the super port in Liverpool and resulting international trade would lead to increased economic benefits. Rail connections were important to help move this economic benefit across the region and help unlock its potential, he explained. “If we are interested in rebalancing [the UK economy]… infrastructure that delivers opportunity is the only way to do it”, Mr Blond said. 20 Miles More Director Andrew Morris asked if Liverpool should be connected to a high speed rail network given its economic importance and size. Responding, Mr Twigg said that economic rebalancing could not be achieved unless Liverpool was included within HS2. He said it was important to make the case for at all levels of decision making. “HS3 is pro-poor and pro-north”, Mr Blond added. He added that there was a risk that Liverpool would not be included within any new proposals for the North. A proposal for a high speed rail link into the city should be included with the One North report, Mr Blond continued. The Chair said that many northerners did not appreciate just how powerful a political force they could be if they lobbied together. Up to 20,000 more people could look to make Liverpool their home if connectivity was improved, Mr Anderson said. Questioned over the process of further devolution, Mr Twigg was reluctant to go down a regional approach that had been adopted by the last Labour Government. A representative of Carillon, drawing on her experience of living in the North East, asked if Newcastle and Leeds should be connected by a high speed rail line. Responding, Mr Anderson did not believe that the Government had either a national or regional transport plan. “I just want to make the case that we go ahead with HS2 and HS3”, he said. For every pound spent on transport projects in the north, another nine was spent in London, Mr Blond said. He suggested that London should have “no right of veto” over infrastructure funding for the North. Labour Prospective Parliamentary Candidate Alan Pugh asked if HS1 and HS2 should be connected. The Chair suggested that “a bit of freight line” could connect the two routes. Later in the meeting, Mr Blond declared that a national infrastructure plan should be driven from a local level.